Photo by Flickr user Eser Karadağ, June 1, 2013. In 2007, I wrote a book called State Repression and the Domestic Democratic Peace. The main premise was that while democratic governments apply less repression than autocracies (i.e., mass killing, censorship, beating, torture, and politically motivated arrests), they still use coercive behavior and, when politically threatened with violence and/or highly radical threats, they will increase repression significantly – sometimes approaching the levels of authoritarian governments (in particular dictatorships, which tend to repress more than single party governments). For several weeks now I’ve been reading different reports about what is happening in Turkey (mostly in the New York Times), waiting for some reference to either my book (yeah, I said it) or the voluminous literature on the topic. Perhaps journalists would even speak to someone from the conflict/violence community for some insight. This has not yet been the case. Instead, we are given a blow-by-blow account of the street battles taking place without any regard to what has been written as well as what we know/what we don’t about the phenomenon of interest. Are the events exactly what we would expect? Does the literature on repression, dissent and contentious politics tell us what happens next? Does the literature give us some sense of what journalists should be asking? Are new insights being provided from what is happening on the ground? From reading news stories we simply have no idea about the questions raised. It all just seems to be new and eventful without much rhyme or reason. Now, this narrative may sell newspapers (well, not as many as back in the day) but this does not really tell us the answer to the questions raised above. I want to take an opening shot at seeing how well we do as researchers and what consideration of this body of work tell us/does not tell us about what is being written/discussed. Let’s start at the beginning. From the news, we are told that the demonstrations all started when some bulldozers went to raze a park. We are not told how many parks had been removed leading up to the incident, how large the crew was, whether they were accompanied by police, what the unemployment rate was in the relevant neighborhood or how sacred/profane/banal the space itself was. Put simply, no context was provided for what would take place. 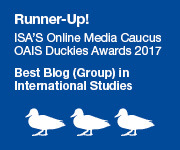 Now, some researchers would push in this direction – especially those in sociology concerned with specific state–dissident interactions as opposed to the more cross-national work put forward in political science. Basically, however, this information has been missing from the discussion and this is consistent with how people study the topic. Most research, however, while focused on events has been largely “eventfully”– oriented with little history and context of the sort noted above. We are told that some citizens protested the razing (“early risers” in the literature) and they were quickly joined by others (“latecomers” in the literature). The reason? Well, some (likely the first group) were upset specifically about the park being torn down; others (likely the second group) were upset about the direction of the country under Prime Minister Erdogan, who is perceived to be moving in an increasingly religious way. We are given very little about the first group – something that would be crucial for the work of James DeNardo, Mark Lichbach, and others. We are given speculation about the second group – something crucial for the work of Karl Dieter Opp and Bert Klandermans. I say we have little here because the reporters are not very clear on whom they talk to and why they selected them. From existing reports, we are not clear on the sequence of tactics that were employed by the different sides. 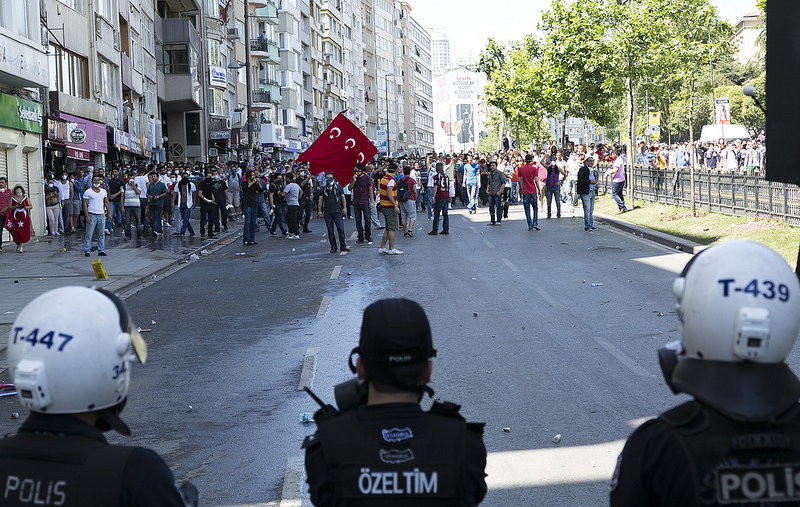 One story notes that violent protesters existed on Saturday (June 1st) which led to the police using tear gas and water cannons. The readers is expected to believe the protesters started out violently, which is consistent with earlier work that just examine violent behavior on its own but not more recent work that considers escalation. This is especially confusing because a different New York Times article suggests that the police were violent earlier. Sequence matters here, and effects how we understand the conflict. It is one thing if the protesters were initially violent and police responded violently. It is quite another if protesters were initially nonviolent and became violent after the police response (that was violent). This has very different implications for third-party perceptions and processes of diffusion/contagion. For example, work on “backlash” suggests that if repressive behavior (i.e., the coercive government response) is believed to be illegitimate and disproportionate to the behavioral challenge put forward, then civilians will be more likely to join protesters as well as decrease support for the government. The article on June 15 also disaggregated protesters into leaders and rank/file. This is important because the former seems to get bought off at one point but the latter wants to keep protesting. Such a distinction is important but largely neglected in the social movement literature and other relevant literature, like work on state repression. It does speak to something that James Scott discusses, however, that social movement organizations are far less dangerous to governments than everyday citizens for the former has a readily conceivable and deliverable price where is the latter does not. Indeed it is the latter’s inability to focus that makes them so dangerous. Evaluations of attempts made by the former to control the latter are sorely needed in literature. Directly relevant to my book as well as the work of others like Fareed Zakaria and Bruce Bueno de Mesquita, the role of democracy is kind of lost in the various pieces that were published in the New York Times. The authors seem to want to discount the fact that a democratic governments engages in repression by referring to the Prime Minister as a “dictator”. The only way the authors as well as the citizens can understand democratic repression therefore is to make the country less democratic. But the leader of a complex political system like a democracy and complex society like Turkey cannot be reduced to such a gross simplification — at least not based on existing research. This assumption was largely maintained within earlier work on state repression but it is now standard practice to note that this is not the case. For example, consider discussions of principal-agent dynamics within Neil Mitchell and Emily Ritter and Courtenay Conrad’s work. Indeed, the “authoritarianization” of democracy avoids the larger point: democracies do engage in repressive behavior/human rights violations. They just do it in particular ways. For example, the article references sound bombs, tear gas and water cannons – all weapons largely developed by democratic countries Darius Rejali tells us. It does not mention gunships, massacres and torture – tactics more common in non-democracies. Additionally, the New York Times article on June 1 refers to a quick withdrawal of the authorities and the willingness of particular parts of the government (i.e., the courts) to negotiate. Although not explicitly examined the literature, this is largely consistent with existing work. Moreover, the June 15 article references an 18 day delay in calling out riot police to quell unrest more aggressively. The delay is also a democratic trait, I would maintain, and one that is consistent with existing literature. Discussion of varying rates of participation across diverse repressive actors is less common but within the work of Courtenay Conrad and Will Moore one can expect more research on this topic coming in the future. First, I advise those of us tracking/discussing/studying the topic to try to chase the actions as well as the actors. If after repression dissident activity increases but different people are doing it, then this means something very different that individuals who were repressed increasing their activity. If we are to understand what is happening on the ground, we need to have some understanding of who is doing what. Without this understanding increased dissident activity is not well understood. Without this understanding, the impact of repression on this activity is not going to be understood either. Related: track the use of the police, militias, the military, courts and the intelligence community. Second, we need to get away from the simplistic understanding that democracies do not engage in coercive action – especially that directed against protesters in particular and those challenging the government in general. Democracies do indeed engage in repressive action but they use very specific methods to do so and these methods are important for us to understand governance, human rights and effective counter challenging behavior. Third, as Neil Mitchell’s latest book reveals democratic leaders frequently avoid being held accountable for repressive activity. Much of the coverage concerning Turkey seems to lay the repressive activity itself at the Erdogan’s doorstep but the Prime Minister is never in the street and I’m sure he’s never fired anything. The relationship and the chains of command involved in coercive activity are essential for understanding exactly what takes place. Recall that after the torture in Gitmo was revealed there was a lot of discussion about who should be held accountable for such behavior but essentially the buck stopped in the barracks. Fourth, related to the last point, Bing Powell’s work also prompts us to pay close attention to what happens electorally after the protest and repression wind down. Within his book, Powell makes the argument that elections are not always the best mechanism for revealing citizen preferences or accountability. Individuals may think about a variety of different things as they step into the ballot box and quite frequently what they think about is not earlier repressive behavior. The New York Times narrative would seem to push in the direction of the Turkish Prime Minister being held accountable for the repressive behavior we are now seeing, and by being held accountable he will likely be removed. Existing literature suggests that this is not the case and indeed what this work would suggest is confusion, obfuscation and continued presence in power. Now, no one has examined this yet – not explicitly but it is consistent with most research on the topic. So as things unfold in Turkey I suggest that we not only look at the streets of Turkey for answers as well as questions but we also consider what knowledgeable individuals about the region have to say as well as those who study the topics directly involved (i.e., state repression and political dissent). Also, keep your eyes out for “Understanding the World: Repression 102”. I recall some protest (in India I think) years ago that was covered by multiple news agencies including the BBC and the New York Times. A more different line could not be taken by those writers. Some claimed that it was a violent battle that left dozens dead, others that the police had attacked peaceful protesters and others still that insisted that it was the work of terrorists instead of the police or protesters. I never did find out what had happened.